In my January tournament, two games entered the Old Indian, which I was unprepared for. In my February tournament, similarly two games entered the Stonewall. And then there was a Winawer. According to my Moskalenko, ...Bf8 followed by ...Bb7 was a surprising pet line of Petrosian. My opponent looked surprised. He broke the tournament silence to say so! I hate this position. I have less space. I have less development. The locked center may give me time to catch up, but why had I prepared a position I dislike? I need more experience. I've turned to blitz. I mentioned I was coaching a USCF 700 student. I decided to teach them the Colle system, and surprisingly, this has re-invigorated my Semi-Slav! Yikes your opponent surely didn't know what he was doing. One never plays c5 in the slav, rather exchange it on d5. BDK - Hehe! Actually, it's kinda fun. In the Advance variation it's quite easy to pick-off those central pawns against an unprepared opponent. CT - Definitely. But before teaching the Colle, I actually responded to c4-c5? with Bd6-Be7? which means I also didn't know what was going on. ok, i do play the french, i luv the cramped position and how white has to constantly guard against the attack on the center pawns. most people groan at the thot of the locked in c8 bishop of the French but once that bishop gets loose. watch out, baby! after all, if it's good enough for Nigel Short and Mikhail Gurevich, it's good enough for me. i admit it, i luv facing the advance variation of the French because while White messes around with those silly pawn pushes, Black is mustering a strong counter-attack. "errm...... in the 1st diagram, a6 followed by c5 pawn break?" Petrosian's approach was to play ...Qd7, ...Nc6, ...Bb7, then ...O-O-O and with his king in an impregnable fortress look for play on the kingside. Most players prefer ...Ba6, trading off light-squared bishops. Moskalenko recommends being flexible and delaying choosing between these plans as long as possible. That's quite evil. Any sample games? I'm curious when exactly you spring the Na3 on your opponent. it's a very unknown line and not many French players know what to do with it and White has fantastic attacking chances. the problem with this line for Black is that where is the g8 Knight going to go? Ne7 wastes precious tempi and cramps Black's position and it will take another 2 tempi to reorganise Black's defence. 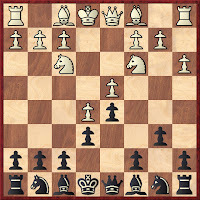 If Nh6 then I simply take the Knight with my dark-square bishop. White can also counter with Qg5 and Black is forced either to play g6 revealing even more Black squares for White (ugly!) or Rg8 and Black's King is stuck in the center permanently with his forces split between 2 halves lacking coordination. in this line, the idea is to try to win the game in the middlegame and not to head to the endgame where the doubled a-pawns are a weakness.